In the early 40’s, when my mother was a young girl of about eight years of age, her father took her and her siblings to visit his mother at Christmas time. Grandmother’s house was small so she decorated a tree in the yard rather than the house. They didn’t find her at home, but my mother’s father told the children they could choose an ornament from the tree. My mother chose this small elephant. 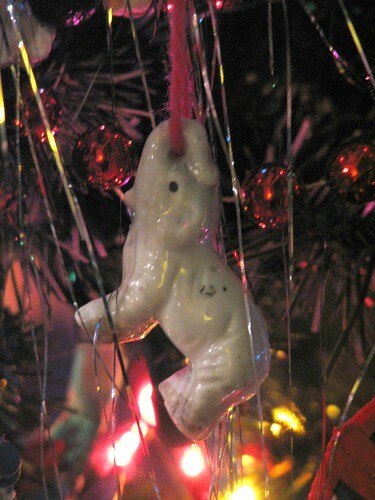 It hung on the tree in our home for all the years of my childhood and after. A few years ago, my mother gave the elephant to me and now it hangs on our Christmas tree each year. It will be passed on one day to my daughter Sarah Jane who is named after her Great-great-grandmother, the original owner of the elephant. I’ve shared this memory at Picture My Memories. This entry was written by ~~Rhonda, posted on December 9, 2007 at 9:21 pm, filed under Christmas, ornaments and tagged Christmas, elephant, family tree, ornament. Bookmark the permalink. Follow any comments here with the RSS feed for this post. Post a comment or leave a trackback: Trackback URL. MY 2 sisters are visiting with me today, and one of them told me about your website. We have throughly enjoyed remineising about Christmas’ past and seeing the lovely decorations you have. WE LOVE IT. Thank you so much for sharing this memory! It just reminded me of the Hallmark ornaments that I get for my kids each year. I buy one’s that remind me of their personalities or things that they liked that year but I have never actually written it out. I guess I know what to do for Picture My Memories around Christmas time! Can’t wait to browse around your site some more. I love Christmas!